I am trying really hard to learn to love salad, I really am. The thing that puts me off so many salads is that they contain so much fat in the oil in the dressing, I’d really just rather pass on the salad and eat my fat in a plate of fries instead. My bad, I know. This salad though is a different kettle of fish, or should I say a different bowl of salad. It’s quick, it’s easy, requires just a few ingredients, can be made ahead and the dressing is totally natural, and totally fat free! 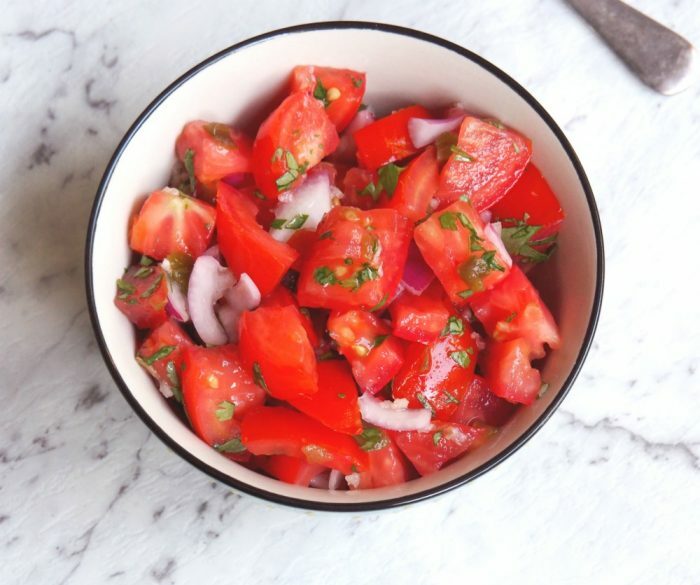 This salad doesn’t just pop with colour, it pops with flavour too. 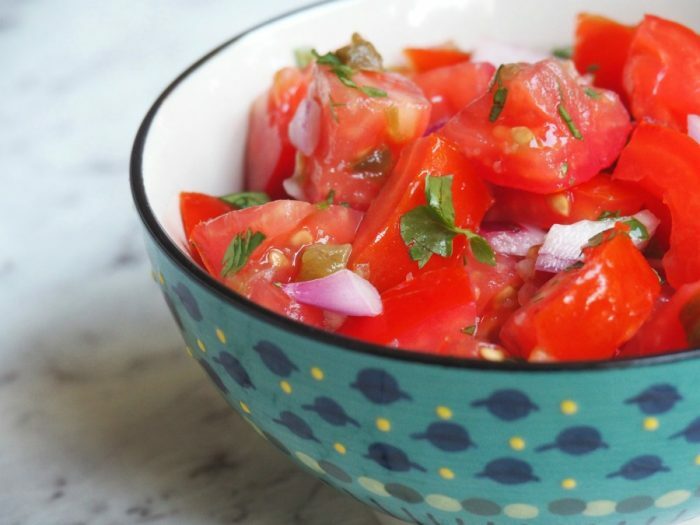 The juicy tomatoes are balanced out with the sweetness of the red onion and the lime juice dressing brings some value added zing. I think the garlic adds a real depth of flavour, but if you’re not a fan, just give it a miss. 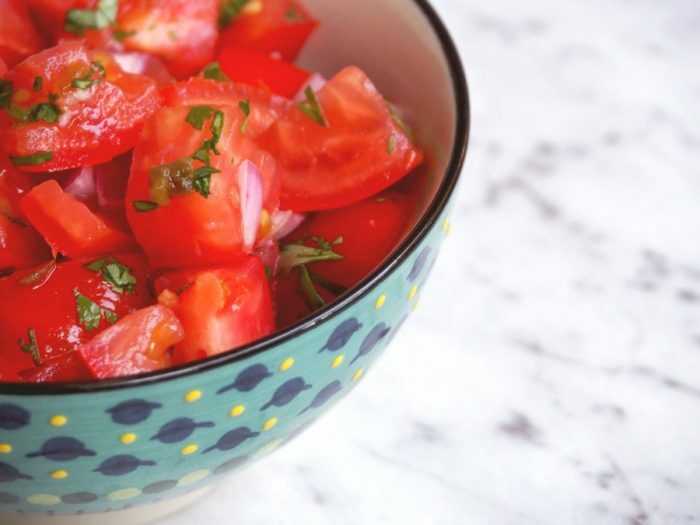 If you’re eating low iodine, this salad is a go-er but swap the jalapenos in a jar for a freshly, finely chopped green chilli with the seeds removed. One thing you don’t want to skip though, is the coriander which brings all the flavours together beautifully. I know it’s such a divisive herb, but in this dish it’s really the herby hero! 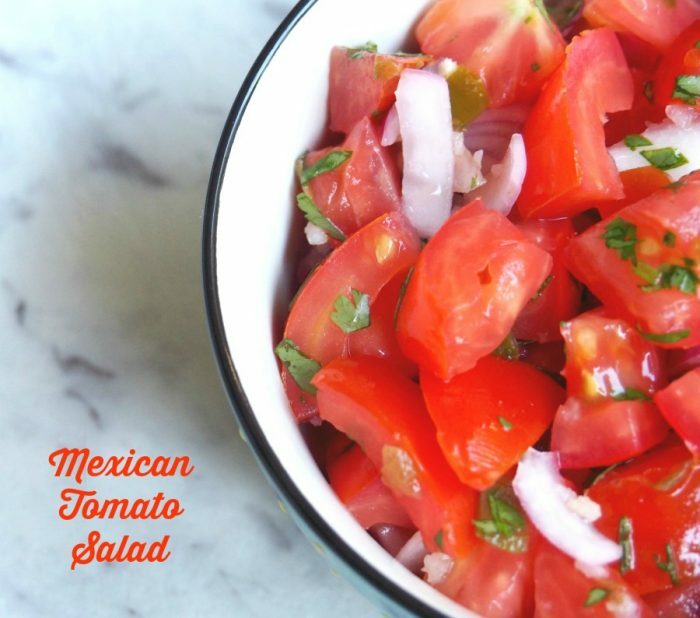 I love that this takes just minutes to make and is make ahead, it’s the perfect accompaniment to any main, especially if it’s of the Mexican variety! Talking of Mexican, have you tried these Rice and Bean Enchiladas, these Mexican Beans with Cheesy Taco Topping or these Spicy Chicken Tacos? Oh, so good! So tell me, are you learning to love salad too? Are you mad about Mexican flavours? Stir everything except the corinader, together in a medium bowl. Season and chill in the fridge. You can do this the day before, if you like. About 20 minutes before you are ready to eat, stir through the coriander and take the salad out of the fridge to get it back to room temperature before serving.